Slash says that he thinks that everyone in the Guns N’ Roses camp would like to make a new studio album, but due to their touring commitments, they haven’t had the chance to sit down and plan it out yet. The reunited lineup featuring Slash, Axl Rose and Duff McKagan have been on the road almost constantly on the Not On This Lifetime tour since getting back together in 2016, leaving fans wondering if a studio return was on the cards. And while Slash says “there’s no shortage of ideas from everybody involved” they still have to properly plan out their future movements. He tells the upcoming issue of Classic Rock magazine: “When Guns N’ Roses started doing its thing on the Not In This Lifetime tour, then the kind of writing I was doing was actually more tailored towards Guns, because that was the environment I was in. “But, then we took the break and I started thinking about doing the Conspirators record. “When it comes down to it, a riff is a riff. It could work in either context. But with The Conspirators, anything I come up with, Myles Kennedy will come up with something – and that’s why it’s such a diverse record. “With Guns, you have no idea where that’s going to go either, so it’s really hard to focus on one or the other, but I feel like while I’m out with Guns I’m thinking about Guns stuff. When I’m out with Conspirators I’m thinking of Conspirators. “I’ve been doing The Conspirators for eight years now, so there’s a certain kind of rhythm that I’ve gotten into with doing that. 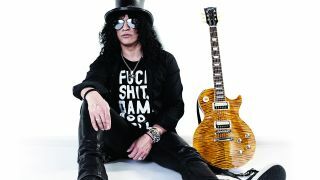 Asked if he’s started to write material for a new Guns N’ Roses album, Slash replies: “Well, it’s not been announced because there’s nothing official, so there’s nothing to talk about. In June, Guns N’ Roses revisited their classic debut album Appetite For Destruction and reissued it on various formats, including the massive Locked N’ Loaded vinyl box set. Slash featuring Myles Kennedy & The Conspirators, meanwhile, will launch their new album Living The Dream on September 21 via Slash's own label Snakepit Records and Roadrunner Records. They shared the first single from the record, Driving Rain, last month.